An INCREDIBLE opportunity to focus on our Heavenly Father is found in this Series which is built upon an incredible fourteen (14) passages of Scripture and bold, beautiful photos of His creation. Each of the passages have personal application in a major way for me personally, my hope is that they will have a similar impact on each person who comes upon this Series. This set started with notes from here and yonder, but were brought together in a manner SO clear presented as a “side item” in a recent Sunday School lesson. If you don’t attend a Sunday School class in your overall church experience, Encouragements like this Series may be passing you by without you even realizing it! 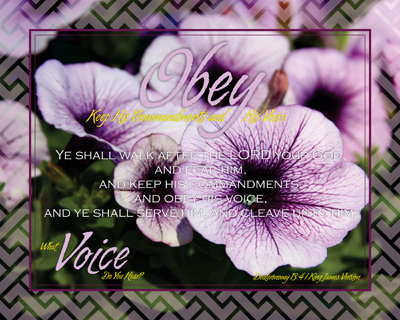 Obeying His Voice does require that we know what His Voice sounds like and that we recognize it when we hear Him Speak. The Holy Spirit, which is in full residence in EVERY born again Christian, is the translator of His Word inside of us. Each of us MUST learn to Trust Him (Proverbs 3:5) and understand that we will Know Him (John 10:27-28) by His Voice. We will not understand His Ways (Isaiah 55:8-9), but we can seek Him and He will add (Matthew 6:33) to us all those things He wants us to and He is our Friend (John 15:15) always. 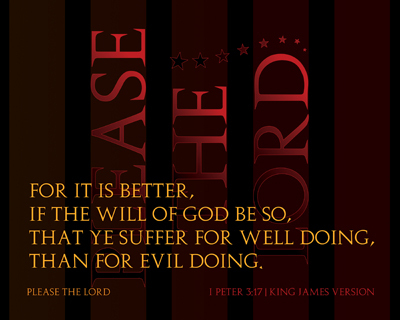 Our Lord does Care (I Peter 5:7) for us and about us, we just have to be willing to Listen for and to Him. The following list of fourteen (14) areas which we can focus on will give us a solid manner in which we know we are following Him and He is with us. The verses of this Series build into a story put together with vibrant buds which have bloomed into distinctive and attention getting flowers and blooms. 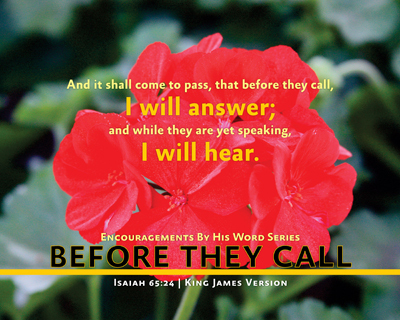 He Promises to Answer us and Hear us, even when like Job, we may not understand why the events, actions taken and seeming injustice are happening around us. Even before we have a glimpse into why this or that is happening, our Gracious Heavenly Father knows all about it. How many times have you heard, along with me, that phrase of all phrases “hindsight is always 20/20” or some close variant? Wouldn’t it be GREAT to have foresight be just a tad more CLEAR instead of the 800/20 as it appears at times to be?! That has much to do with how this Series has been developed – the words of the Scriptures have been masked or purposefully tucked into the photographs, not hidden so much as to not found, mimicking the closeness we need to have with our Saviour in order to say these verses with Faith. As one takes a look at each print, the text becomes less aloof and can be found without too much over inspection. The closer we are to walking and having a daily relationship with our Saviour, the easier it will be to see the Word of God as it Speaks to us through the Holy Spirit. We will then have the right perspective in seeing what He tells us and placing Faith in what He says He will do. There are ten (10) words that come from ten passages of Scripture, from Isaiah, Job, Psalms, Matthew and Philippians, which will help us “see” His handiwork as we draw closer to Him. Job said he would Trust Him. David knew the weight of sin and the completeness of Forgiveness. The prophets of old knew everyone would come to Worship the One and Only True Jehovah God. 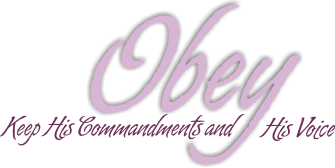 Jesus gave us the instructions on how to have communication by the Lord to the Father while were are yet on this Earth. Paul knew what the steps in front of him were FAR more important than what had been done before the point in which he was working toward. Each one of these words can be used to help every Christian more forward to a closer walk with the Saviour. Many Christians, even NON-Christians, immediately think of the Lord talking to Simon Peter in John 21:15 through verse 25 which is where we get the Feed My Sheep/Lambs and Follow Me from in the Scriptures and general speaking. Often because the story is so recognized we can forget that there may be other places it occurs with a different application – this is one of those such occurrences. This Series pulls a theme from six Old Testament passages and seven New Testament ones, from Psalms to Titus. At first the wording may strike you a bit odd, but the challenge will remain to find out why it Spoke to me – of course the Word will have to Speak to you too… The Old Testament passages were more difficult to see, but with context work and asking the Lord to help me understand – the understanding came much more easily. These baker’s dozen (13) confirming responses derived from both Old Testament and New Testament verses of Scripture were NO WHERE near what was first expected. It is my hope and hearts desire that you too will see what God the Father is saying through the passages shown. The more they are looked at, pondered and re-read, the more moving they become – we can as Christians walk with Him, converse with Him and know what He wants us to do. The Holy Spirit within us enables that to take place, which the Saviour paid for each of us to have the opportunity of Eternity to do so – right NOW – we do not have to wait. Will we see these responses for what they are – our willingness to put down ourselves and pick up the righteousness of Jesus to follow our Heavenly Father’s Direction? Every Series to me is enjoyable and has a direct impact on what is being done all around me – it is the driving reason they are developed. Many of them are tied to music, as is this one, having a fair amount of research done to develop them into a free standing study, display set and thought. While this Series is small (to me at least) in the presentation of study, it was an expansive project which covered over fifty defined words (word choices) and several thousand verses of Scripture. Simply put, it has been an Amazing time with the LORD! The song “He Is Here”, written by Kirk Talley, is a slow, VERY deep, thought provoking song which reminds us that indeed God is with us. While it speaks of the “Presence of the Lord” being in a place such as a church or worship center, that place can be wherever you are. My preference is to be in constant awareness of Him and ready to commune, but of course I’m human, just like everyone else. That is where a pattern was picked up in the Scripture research – a difference of preparation or being ready was presented in the Old Testament Scriptures than in the New Testament ones. In general the Old Testament passages present the reader with a “if you will do this…” where the New Testament passages are more geared toward “when you do this…” Interesting? Absolutely! The difference is in when the texts were written (almost wrote txts like it was being delivered on a phone…), the Old Testament is in part largely a historical account on events, where the New Testament (for the most part) was being lived at the time it was being written. The letters in the NT were being delivered and read to congregations and groups of people. Both OT and NT Scripture are used in this Series, only two passages were chosen per word in an effort to keep the Series manageable in design and reading. The first verse utilized is from my absolute favorite Bible character Nehemiah – see what they did – they got the Good Book and read it!!! What a testimony and example to each of us, whether that be when things are the bleakest or are going the best – His Word guides. The following meaningful words form a list of nine (9) items that we can draw how we can each know He has been Present and is currently Present in our lives from God’s Word. As soon as the digging began, the results appeared to be a little different in how the search was turning up Scripture references. The New Testament references seemed to have a different tone to them, which later when the Old Testament were compared, it was very different indeed. The NT are presented from a “when” perspective, as in when you get to this point or place, “remember” this that I’m telling you. “We having” and “Now thanks be” are two examples given that show us that from II Corinthians chapter 4 and 2. The instant it was noticed, a tweak was made in the presentation, so it could be noted by visual differences. The Old Testament verses of Scripture are based upon “if” and “might” for the actions to be true, as if they had not an example to follow. In a large degree, that is exactly what it is – we have the Holy Spirit resident within us as Christians AND Jesus Christ was conceived, born, lived, died and rose again to provide the instruction and daily living example we are given to model. It is NOT a Salvation or no Salvation question of consideration for the New Testament versus the Old Testament, it is because the NT is written in large part to Christians as a daily living book verses a historical book that the OT provides for us. Do keep in mind that “mans ways” are the considerations for this Series. It was very interesting to see that played out in the verses of the “more sure Word” we have now than they did then – what an AMAZING GOD we serve! There are twenty-two (22) total words which make up this Series in some three pieces: the defining, New Testament and Old Testament. We should so want to Please The Lord in every thing we do – it should be what “Defines Us” in such a convoluted world today. When others see us living to Please Him, doing what is Right in His Eyes, even the most callused of the world will know the Who we serve. Personally know it is true because it is the world that is worked in, do you? Digging into a rich and thick backlog of Series concepts and rough drafts, along with our music director at church singing this song on Sunday night during benediction, this particular one has now been completed. Every time this song’s verses are seen, the chorus immediately comes to mind, which causes me to sing the verse being seen to be rushed a bit to get back to slowing down for that chorus. The rest of the hymn/music piece does present a solid description and response to the Word of God, I just happen to like the chorus because it slows down nicely which causes me to think about how GOOD the Lord has been to ME! The Word of God is an Ancient text, compared to our time “right now”, which contains a Living Word that supplies Life to those who will read it, hear it and be changed by it. An amazing item about this book for me is the age of the Word – In the beginning… and how relevant that Word is to us today “to the faithful in Christ Jesus.” The more time marches on, the more of the Bible is proven to be true by the world’s measuring stick, indeed it is the only book which chronicles history in a manner not other writing have achieved. Some have said, and continue to say, that the Bible is no longer relevant because it is an “Ancient” work – they are missing the vital key to understanding the transforming part of it. There is a requirement to understanding it, as Ancient as it may be considered, that is deciphering power of the Holy Spirit. Man can do NO work on the heart, no matter what is said or done, but the Holy Spirit is the agent whereby we can understand, realize our position, trust and believe. One can read the Bible from cover to cover, but without conviction, there will be no remission AND there will be no understanding without conversion. The Ancient Words come to life when we know the Author of them and then can become familiar not only the written Word but our communication with our Heavenly Father. A person could say that the Bible is situational so to speak as it can be driven by where we find ourselves in relation to the Scripture we might read. The passages read, truths discovered and convictions solidified very well can depend on what is going on with us at that moment in time. NOTICE – I did NOT say that the Word of God changes – it is US that changes – we either are getting more aligned with Him or less aligned with Him. As can be noticed in the Title artifacts “Changing Me and Changing You”, that is EXACTLY what those Ancient Words are capable of doing. The entire focus of this Series is really meant to cause each one of us to take a look at what influences, changes, entices us to do things in our daily lives. The more of those Ancient Words that are on the intake and study, the less of the negative worldly enticements have an opportunity to get a lodging place or toe hold in our lives. 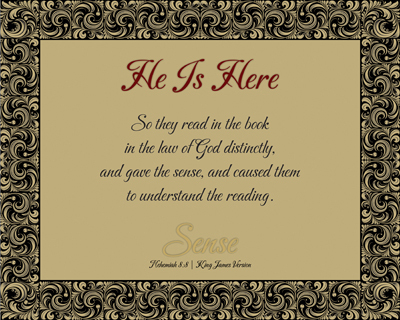 It is one of the reasons that we can read a specific passage several times over a period of time and have it apply to different aspects of our lives because of where we are in our Spiritual Walk with the Lord. Amazingly and for so many times, a passage of Scripture can “speak” to me, sometimes in an uplifting manner and others in a scolding manner, doing what we could consider polar opposites of what happened before. The situation in me/us is what changed, not the Scripture, nor the Author, or the validity of the Word. There are five areas that are utilized in this Series to convey the meaning of what the Ancient Words of God’s Word should mean to us. They are indeed changers, they do not change themselves, it is us who conform to them and the image of His dear Son, the Lovely Lord Jesus Christ, the Saviour of the World. 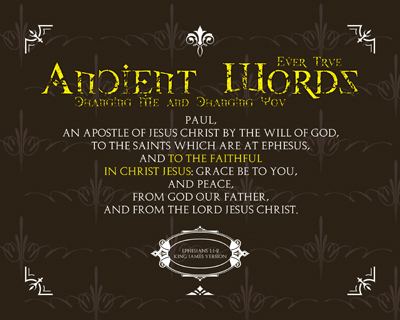 There are a number of passages included with this Series and the words of the Hymn of the same name. Will we heed the Ancient Words? They must be read, meditated over and hid in our hearts so we can do that very thing. This Series really has swelled up and poured out over thirty words and verses from the Word of God – the Bible. It really began as just a few verses and only six words, before it reached the set it is now in completion. James 5:13-16 had been written down on a “concept” card for a good while, so as a recent sermon by our Pastor reminded me of it, you can see the finished product that fits together like a puzzle. Each one interlocks and completes one another. The words build upon the end word – Again. The verses which this Series is built have a building block example of how one should pray, provided in the form of question then answer for each. Am reminded, as is done every Sunday in the class that Melissa and I have the honor to teach, that we can teach others HOW TO pray – but we CAN NOT teach them TO pray, that comes from the LORD! As we go through each lesson, a building block plan is used, much like this verse, on the how’s or mechanics of praying given to us directly from the Word of God, the Bible. It is REALLY that simple, just as we come to Him in childlike faith, so should we return to Him asking so. Oftentimes we each may face a specific challenge or circumstance which might cause us a set back, a slow down in life or an utter derailment, but it doesn’t have to remain that way. This Series is all about that very thing, thirty (30) items which we can do “Again” because the Lord gives us the ability, opportunity and possibility to do so. But first, we are going to have to get in tune with the Heavenly Father – we need both the Word of God and a Throne Room visitation plan. Only then will the remaining twenty-nine (29) “Again’s” make sense to us, because then and only then will we be receptive and open to the change that God the Father will make in us through the Holy Spirit in order to work them. The following “list” so to speak, contains thirty “Again” statements which can be build as phrases, such as: “prepare to Endure Again”, “experience Grace Again” and “know Peace Again”. Each of these words come from God’s Living Word to each of us, one’s in which can be a reminder of His Gracious Love or those that we need to return to Him for guidance and help re-applying in our lives. For some of us, it will probably be a combination of the two – a daily reminder that Prayer is our strongest asset to the One who can help us with it All. When is the last time that you personally have been so moved by a Truth that is worked you over so thoroughly that all that was known to do is to call out to the Heavenly Father, the Creator of Everything, to say Thank You? I’m not talking about getting up and jumping around, but rather directly the opposite of it – in the manner of realizing a little more just Who God the Father is and how MUCH He loves you and me. This is the outpouring of one of those moments. Those three words, Let Us Pray, were repeated in a request of a dear friend in a Social Media realm where a song was posted and a challenge issued to listen to it. So, I did. And again. And again. And again – many more times, to grab the words of the song. Is there someone you know that needs to come back to the Lord, or has never known the Lord as Savior? 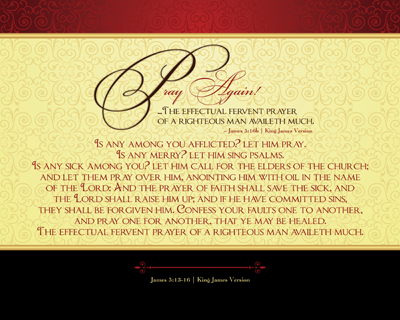 A clear challenge was presented to “Let Us Pray for those precious souls!” In just the next sentence, the declaration of “It worked for me!” is made, then a repeat of the challenge to us, “Let Us Pray!”. No Matter, He Will! Not only Pray, but also Love them the way our Lord Loves Us… It takes a willingness to get out of our personal space and make the steps into the lives of others, otherwise they may never understand that He WILL run to them – as He has us already. 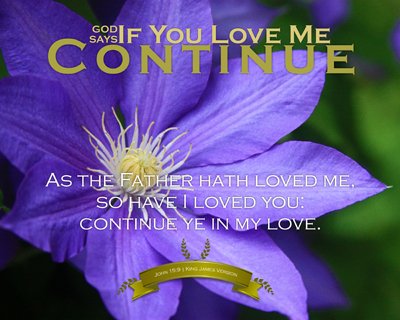 YES – Let US Pray and Let US Love them to the Lord Jesus, for we know His LOVE for Us and THEM!!! Oh to hear the Lord call us Son & Daughter and say “I LOVE YOU!”. We may be the ONLY one that Prays for them and and the only one who will Love them to the Lovely Saviour – Jesus Christ! It has worked for me too – Let us Pray and Love them! With every fiber in us, we need to recall our own Damascus Road experience – that experience is the beginning of our Testimony – which can be shared with others, telling them of what the Saviour has done for us. In addition to that, we may very well be used of God to share our own difficulties with another person so that they might see that God the Father’s arms are wide open. This kind of commitment will take time, prayer and work, which we are given all the power we need to point them at Him. The Song’s name is “When God Ran” which was written by Benny Hester & John Parenti and then recorded by Benny Hester a number of years ago. To suit personal likes, preferences and given standards, the musicians who sang/performed the version that was recommended and directly linked, will not be linked here. There are several artists who have recorded this song, so a search on YouTube.com should provide a variety of choices which may suit each person’s interests. 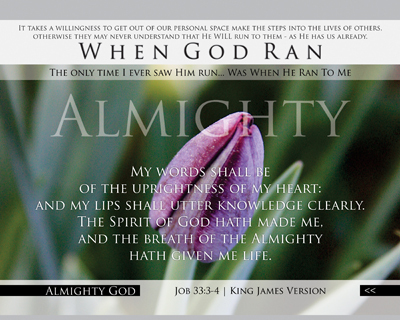 There are twelve identifiable descriptions used in this Series taken directly from the lyrics of When God Ran. These twelve (12) descriptions have been translated into prints and are by no means an exhaustive list. They do, however, cover the majority of the items discussed in the lyrics of the song. As you take the time to look them over and maybe hear a group or person sing this wonderful song, do consider getting out of our comfort zones so we can care about and attend to those that are around us who may be hurting. Many will not know that God is JUST waiting for them to turn to Him and others may have gotten lost along their way and need to be reassured that our Creator and Saviour has in no way loved them any less because of what they’ve done. They too can look once again to the Cross and know they can be forgiven, they just may need a little help from me and you, by an outstretched hand who has prayed for this time to happen… to see them whole, once again.